Harold Eustace Whyte, more commonly known as Rollie, was the son of William Whyte and Sarah Green. After a few years of life, his father disappeared after embezzling money from the Dunsmuir family. His mother soon re-married Duncan Irvine who had taken the young Rollie under his wing. Harold was described to have possessed priceless qualities, and extraordinary compassion. He was a family man with great respect, and like many of his other family members from the Green family, he was highly thought of and respected. Rollie was seen as a tower of support and compassion for those within his family. He attended Victoria High School and excelled in Geography. Not long after, his stepfather put him through McGill University and he became a land surveyor. As a land surveyor, his job took him to remote parts of the island and the mainland. He soon married Edna Green in December 1915. He left the island in June 1916 with the 102nd Battalion. He arrived in France mid-August of the same year. Within three weeks of being in the trenches he was wounded and then returned home. He had become one of the many who had been injured and affected by the Great War. I am from the family line. But not from their decisions. I am from the home I’ve grown up in. To the time I spent in the War. I am not my father’s decisions. And the support of my step-father. But I am not my father’s decisions. To the time I spent face to face with battle. I am the wounds I took for my country. I am the beholder of the beauty in life. To the tears of joy. From my love of geography. Of my comrades in the 102nd Battalion. I am from the love of my country. 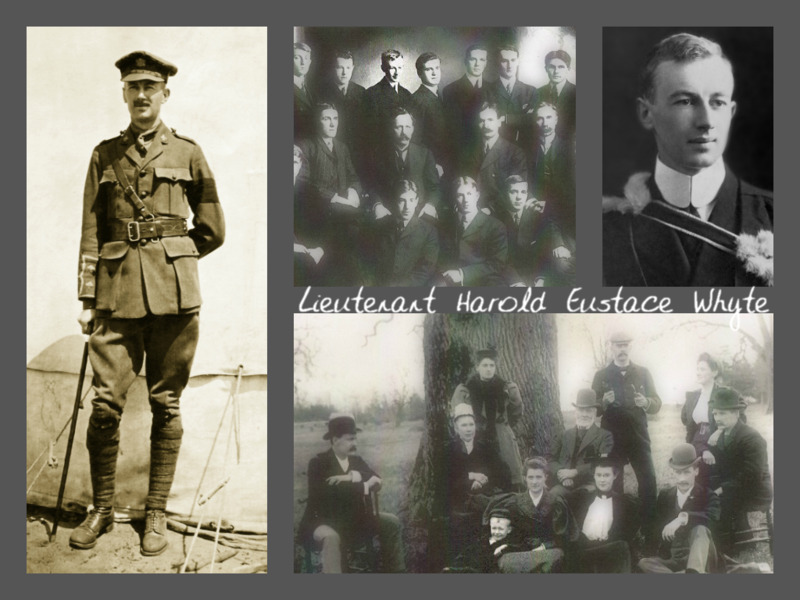 I am Lieutenant Harold Eustace Whyte.